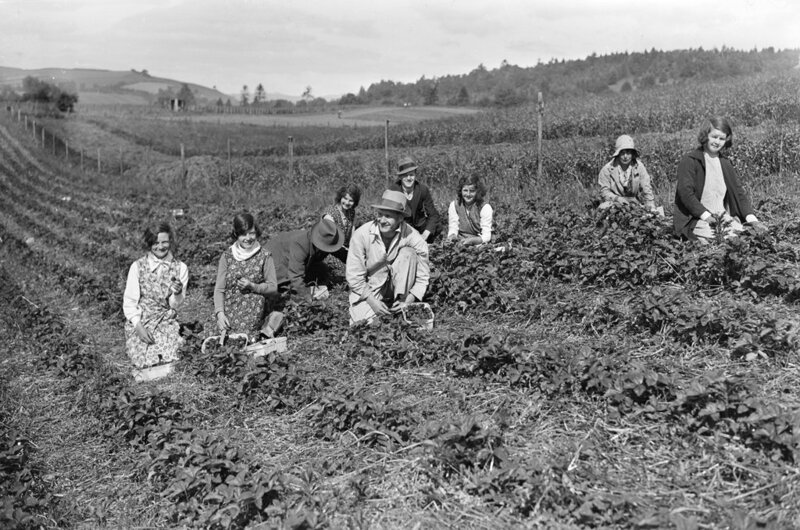 Do have a browse through them – I guarantee you’ll learn something surprising that you didn’t know about Alyth and its environs. Many thanks to Clare Cooper, co-producer of Cateran’s Common Wealth, for sharing them with us. Update on the new defibrillator in the Market Square: we’re planning a community seminar and training session in March in association with the Community Heartbeat Trust on what to do in an emergency – watch this space for more details. In the meantime, the box is programmed to talk you through what needs to be done, and here’s a handy cribsheet on steps to take in an emergency. The important thing to do first is to phone 999 and the ambulance service will talk you through getting access to the box. If you don’t have a phone on you, the shops, cafe, hotel and even private houses nearby will help in an emergency. Some have asked why we need a security access code. We decided on a locked box to avoid vandalism as itis in such a public place and to ensure that the defib was available when needed. Some boxes elsewhere are unlocked, but they are inside halls or other community facilities. In any emergency the first thing to do before you try to use any defib is to PHONE AN AMBULANCE (or get someone else to do this). So if you don’t have phone you borrow one or go into a shop or the hotel or café – this is an emergency! There are not many times in the town when a phone will not be available from someone to use. 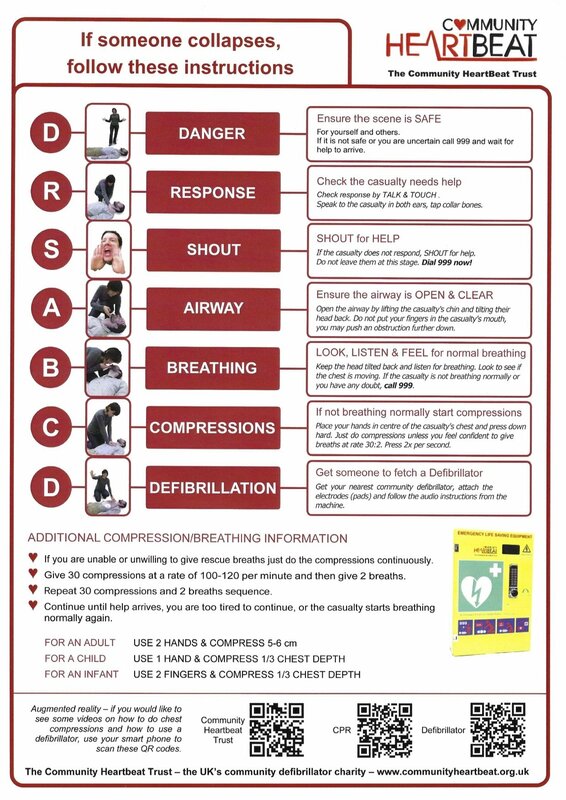 The ambulance service will give you the code help you with what to do if you are not first-aid trained. We’re planning a community seminar about this in March in association with the Community Heartbeat Trust to inform folk about cardiac arrest and what to do in such an emergency. However, even if you are not trained the box will guide you through what to do – it literally speaks to you and tells you how to use it. We’ve just installed the first of three defibrillators to help save lives in and around Alyth. Defibrillators are life-saving machines used to re-start someone’s heart if they have a heart attack. In a rural community like Alyth, fast access to an ambulance is not always possible, yet there is only a window of five minutes to re-start a stopped heart before fatal brain damage is done – so access to these machines needs to be fast. J W Wheatley & Son installed the first defibrillator in the squinty phone box in the Market Square yesterday (18 January) and reconnected the electrical power supply which helps keep the equipment frost-free in the winter months. We’re now finalising the paperwork to enable the Scottish Ambulance Service to switch it on. 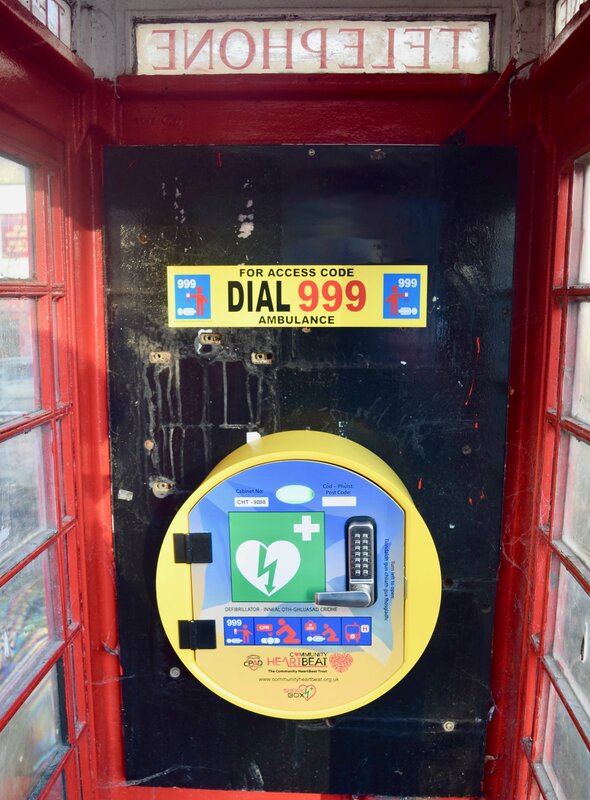 When it’s live, anyone needing to use it must phone 999 to get the security access code to open the box and access the defibrillator. 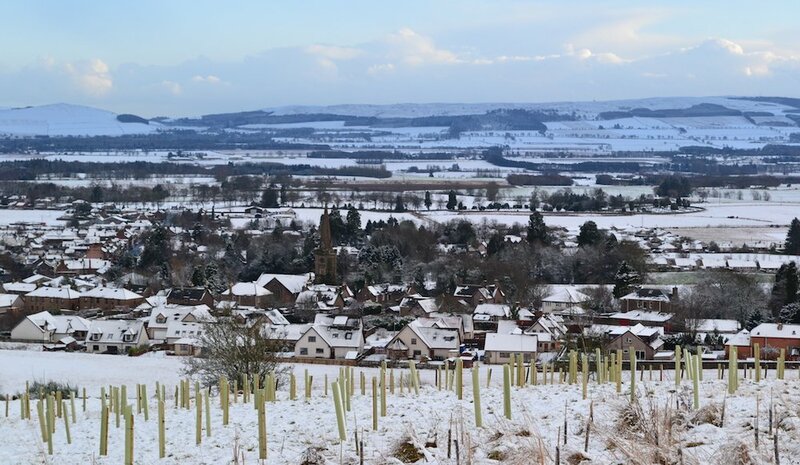 The security access code means the life-saving equipment in the box is secure until it is needed, and we hope everyone in Alyth will help keep it safe from vandals and challenge anyone who is trying to damage it – your life could literally depend on it! We are planning a community training session in the Spring on how to deal with a cardiac arrest emergency and how to use the defibrillator – details and date to follow soon. Don’t worry if you can’t get to this training session. In the event of someone having a heart attack and needing the defibrillator the equipment is designed to be used by any member of the public without any training. When you open the box the machine speaks to you and guides you through exactly what to do. IMPORTANT – remember to always phone for an ambulance first before you try to use any defibrillator. We’re immensely grateful to to The Collective Dairy (makers of amazingly tasty yoghurt – the one with the black lid and the cow’s head on) for funding the first of Alyth’s publicly accessible defibrillators in the Market Square. Their donation is in memory of Mike Hodgson, co-founder of The Collective UK, who tragically passed away in August 2015 after suffering a sudden cardiac arrest while riding his bike in the Lake District. We hope that their kind donation will be a life saver for anyone in Alyth in the unfortunate position of needing a defibrillator. We’re also very thankful to the Drumderg Wind-Farm Community Fund for a micro-grant of £300 enabling us to reconnect the electrical power supply to the phone box. We’ll be submitting a Drumderg application in early February to fund another two defibrillators, one for New Alyth and one for the Den Car Park. PS: Just in case you think the defibrillator box looks a bit squint, it is actually level but the phone box itself is squint! We found out that it would cost about £2000 to get the phone box straight, so we hope most people will agree that this wouldn’t be best use of such a large amount of community funding. 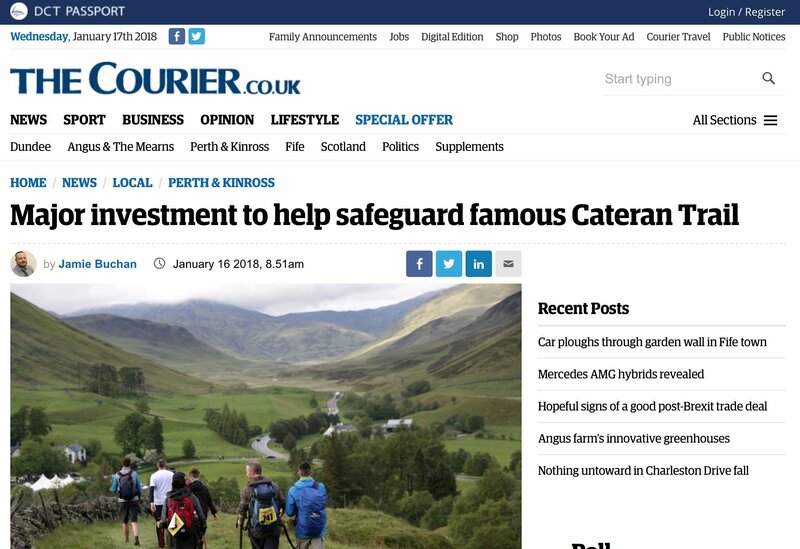 Any thoughts on where/how Alyth might attract similar investment for the parts of the Trail that run through our patch? Paths For All, the government-funded charity, have been in touch with ADT promoting their grants and training. 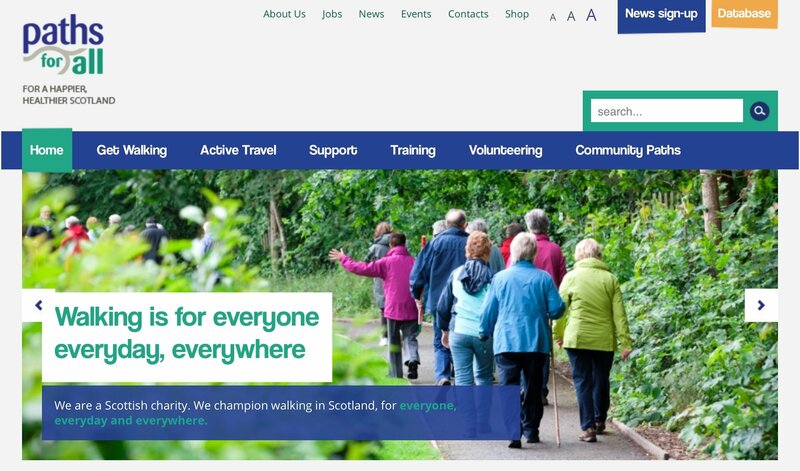 Small grants of up to £3000 are available to communities in Scotland to develop, deliver and promote their own community led active travel projects. PFA is also running a range of training courses on how to design, build and maintain community paths. 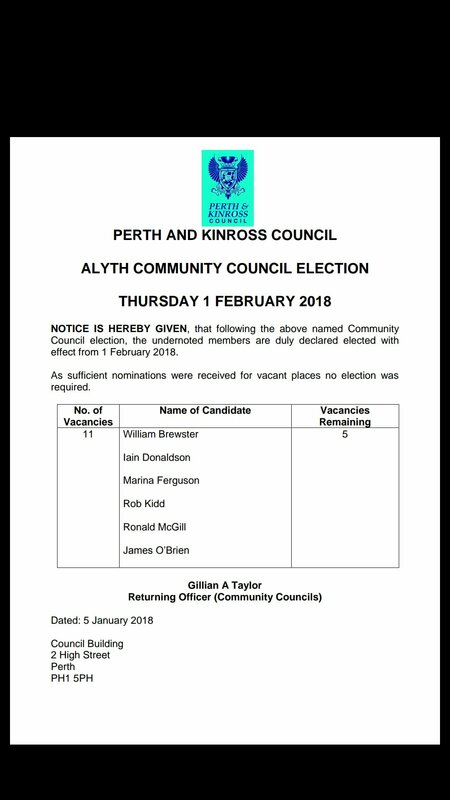 It seems that the Alyth Community Council, which has been in abeyance for quite some time, has now been resurrected. We have no further information at the moment, but we’ll try to keep you up to date with any more details as they come out. Please send your comments to editor@alythvoice.co.uk There is also a comments sheet in Alyth Library, or you can message us through Facebook – either our page or the Voice page. The developers are currently meeting local groups and organisations, including ADT, and if we receive a lot of comments, we will be asking the developers to hold a public meeting so that everyone can talk to them. Glenisla Developments say they want to engage with the local community and organisations in the run-up to and throughout the process of getting detailed planning permission later this year. 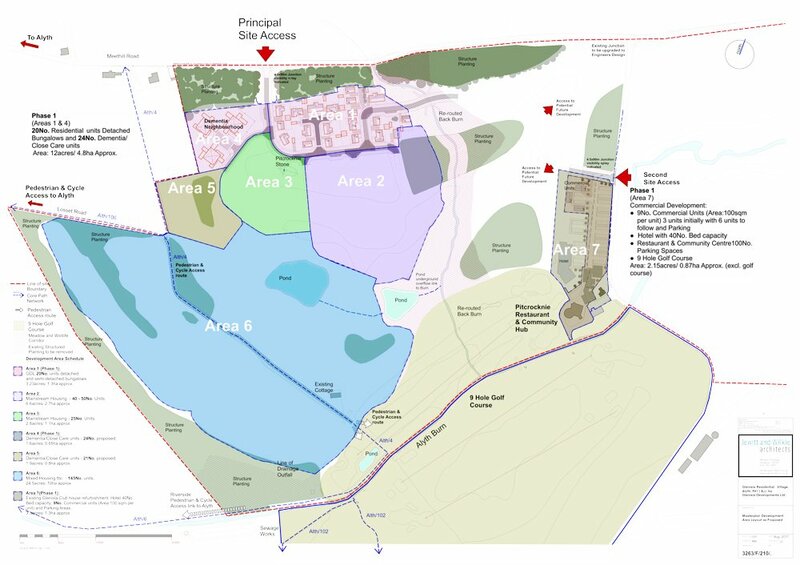 ADT wants to encourage and promote as much discussion and debate about this massive new development of our town as possible, and we urge you to make sure your views are heard either by talking to the developers direct, or through the pages of the Voice over the coming months and years as the project proceeds. What do you think about the Glenisla development? Will it be a good thing or a bad thing, and why? What do you like about it? What don’t you like? What would you like to see changed, if anything? Let us know and we’ll do our best to make sure that all views are fairly represented.